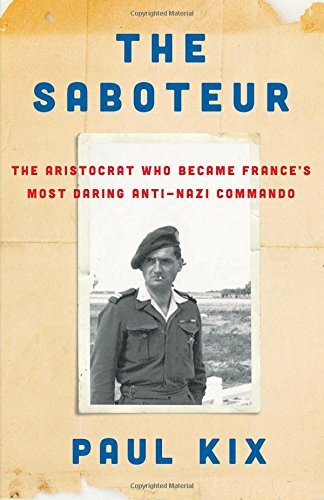 This is the largely untold story of French commandos during WWII, led by an aristocrat from a famous family who was trained by the British spy office called Special Operative Executive (SOE). It’s evocative, it captivates, and the reader will not want to put it down. Robert de La Rochefoucauld, whose aristocratic family trace their lineage to ancient France, became a saboteur of Nazi troops, armor, and military positions. He led missions to destroy German ammunition dumps, petrol depots, trains, and tracks, and military factories. He was raised in the finest chateaus and educated in the best schools France had to offer. Yet his patriotic duty motivated him to repeatedly risk his life for the future of a free France. After his father was arrested by Nazis, LaRochefoucauld escaped to England, where he was trained in the black arts of sedition, revolution, and explosives by England’s nascent spy office, the SOE. After many months of education, training, and skills acquisition with plastic explosives, LaRochefoucauld was parachuted back into France behind enemy lines, where he led missions creating disorder and damage to the German military machine. In performing these daring fetes at the risk of his own life, La Rochefoucauld wrote his name into the legends of French history. Barely beyond a teenager himself, La Rochefoucauld organized countless missions against Nazis in France. He observed and reported on Gestapo and German troop movements, intercepted clandestine communications, planted explosives, shot and executed German officers, destroyed factories, trained countless resistors under his command, and carried out every assignment he was given. As he was trained, La Rochefoucauld used various disguises and impersonations to maximum effect. In one case, he jumped off of a truck on the way to his own execution. In another, he dressed in a nun’s habit to escape Nazis in a French city. La Rochefoucauld was captured by the Germans several times, survived horrendous torture for information without cracking, and miraculously escaped certain death several times. Trained to break into Nazi safes, La Rochefoucauld also planted bombs that destroyed Nazi factories and demolished countless German positions. He learned to kill with his bare hands. In prison, his fingernails were pulled out and his teeth kicked out. The daily torture took its toll physically, emotionally, and mentally. Yet in each case his courage and determination led to survival or escape. Author Paul Kix has performed a masterful task with research and writing. The book has also been very well edited. The Saboteur is fast reading, exciting and haunting; driving the reader onward at every turn. That this is a true story filled with powerful and persuasive characters, makes it all the more enticing. Here we witness the birth of contemporary international spy agencies, including America’s Central Intelligence Agency. Anyone interested in learning about how French citizens became spies and served France during the Nazi occupation will greatly enjoy this powerful, fast-reading book about real people willing to sacrifice everything for their nation. Here, the course of history was changed. For the first time in Europe, an “ungentlemanly” type of warfare began. Hit and run was the only way that small groups of commandos could succeed against regiments of Nazi troops with Panzer support and well-trained Gestapo agents. Later, it became known as “guerilla warfare.” Robert de La Rochefoucauld was one of its first inspired leaders. The author presents his mammoth effort with meticulous research. Memoirs of historical figures are rarely proffered with so much attached proof, references and viable historical notes. Yet, Kix tells us that, “more than 20% of the citizens of Nazi-occupied France collaborated with the Germans.” Somehow, the inspired 1% of brave, honorable Frenchmen,” trained by Brits and sent back into France—fighting against Nazi occupiers—managed to succeed over the 20% of their brothers and sisters who aided and assisted Nazis in brutally occupying France. Paul Kix drops this melancholy realization bomb upon readers just as we are enjoying a positive ending. While readers may feel boundless joy at the ending about how the acts of an individual spy and war hero helped to save the nation, many other Frenchmen colluded with Nazis as they controlled France and sent hundreds of thousands of French Jews to their deaths, including tens of thousands of Jewish children. Life is rarely so easily explained in conditions of war and genocide. Yet few historical events extend so easily the palpable, predictable evil of a nation gone bad (Nazi Germany) and the powerful heroes of brave Allies (French spies, trained by England).